With the Olympics rivalled only by the World Cup when it comes to viewing figures, it's hardly surprising that the Games are no stranger to new broadcast tech. Back in 1964, host city Tokyo was the first to broadcast live TV images via satellite to a gobsmacked world, and local company Toshiba even filmed the sumo wrestling and judo events using its new colour transmission system. In 2020 it'll be Tokyo's turn to host the Games again – and once again the host city will be showing off some serious advances in broadcasting tech. Anyone who said Japan was falling off its perch when it comes to TV tech might want to get ready to eat those words, with 8K, VR, AR and smart stadiums all set to be on the starting blocks four years from now. London 2012 might have been the first social media Olympics, but Rio 2016 will be all about a multi-platform games. Rather than going to a bar or a friend's home to watch hour after hour of track and field, we'll all mostly be at home, dipping in and out of the on-screen action on whatever device is most convenient. In fact, as many as 64% of viewers in the UK will use a second-screen device during the games, according to RadiumOne. The TV might be the focus – the BBC in the UK, NBC in the US and Channel 7 in Australia – but there'll be plenty more happening on smartphones and tablets from August 5-21. In the UK it's all about the BBC and its iPlayer, which is available on every platform going. The Beeb will show a whopping 3,000 hours of live, free-to-air TV from Rio spread over its four TV channels and multiple apps. Just as at London 2012, the BBC will deliver 24 live HD video streams, broadcasting eight of them live on its Red Button interactive service. In the US, head for the NBC Olympics Live Extra app. In Australia, Channel 7 will broadcast 1,000 hours free-to-air, and provide online live broadcasts and catch-up. However, if you want access to 36 live streams from Rio, that means getting the PLUS7 app, which is reported to be charging for access during the games. The BBC trialled 8K broadcasts at the London 2012 Games, and the Olympics Broadcasting Services will film some 130 hours of 8K video in Rio, complete with 22.2-channel audio surround sound and including the opening and closing ceremonies, as well as some coverage of judo, football, swimming and basketball. However, these sizzling 7,680 x 4,320 resolution images are being shot as a test, and will be downscaled to 4K, then to Full HD for broadcast. By 2020, though, 8K will be a thing. 8K or Super Hi-Vision is already emerging in Japan, with Sharp selling 85-inch 8K displays, and Japan's state broadcaster, NHK, wants to broadcast the 2020 Tokyo Olympics live on a new 8K TV channel. Test broadcasts will begin in 2018, ahead of that year's Winter Olympics in Pyeongchang, South Korea. In readiness to display these 32-megapixel images come Tokyo 2020, all major TV makers are preparing 8K TVs. Panasonic has started a 'Beautiful Japan 2020' campaign, which is aimed at fuelling national loyalty in the run-up to Tokyo 2020. And by then a new kind of video could also be on offer if Mitsubishi Electric has its way: holographic 'aerial' displays that create the illusion of floating objects projected into mid-air, probably in public spaces in Tokyo – and that means above Shibuya Crossing. Some 85 hours of VR programming is being produced in Rio, but it appears that this will only be available to users of the NBC Sports app in the US who also have a Samsung Galaxy smartphone and a Samsung Gear VR. So, while these Olympics will be available to watch in VR, only those people who have the right phone, the right headset and the right subscription will be able to view it, meaning it'll be far from widely available. Getting the 360-degree treatment will be the opening and closing ceremonies, men's basketball, gymnastics, track and field, beach volleyball, diving, boxing and fencing, all available on a one-day delay. Strictly speaking, of course, 360-degree video isn't true VR, but rather immersive video. Still, with VR headsets likely to be everywhere by 2020, Tokyo 2020 is destined for the all-over wraparound treatment. Meanwhile, Japanese company MeLeap wants to host an AR sports event during Tokyo 2020 to promote its Technosports platform. It's an intriguing concept – why watch your heroes battle for medals when you can be the hero yourself? Although sports broadcasters are now filming in HDR, no one is actually watching it, as there are so few platforms that are actually transmitting using the technology, as well as a dearth of TVs that can properly show the images. That's a shame, because outdoor sports really benefit from HDR, with the latest cameras able to make good use of natural light to deliver best-ever colour, exposure and detail that instantly adds startling realism. Professional TV cameras capture HDR as two streams at different exposures and combine them, so what the viewer sees looks incredibly lifelike, and the abundance of natural light in stadiums and sports venues makes them ideal for HDR filming techniques. "The problem sports coverage has is in terms of shadow and bright tropical light – it's a very difficult thing to shoot in the Olympic Stadium – but that's going to be really improved by HDR," says Paul Gray, a technology analyst at IHS Markit. There are a few challenges still to overcome before HDR can be considered ready for prime time – for instance, there's a question over which standard is best, meaning that some HDR-ready TVs can't show all HDR signals. But HDR filming is being experimented with at Rio, and should be default by 2020. Come Tokyo 2020, second-screening won't just be for the home. "More and more fans expect content on devices while in a venue, and venues look to provide unique experiences in every space within and around the venue," says Sébastien Verlaine, marketing manager EMEA at EVS, which produces 4K live action replays. 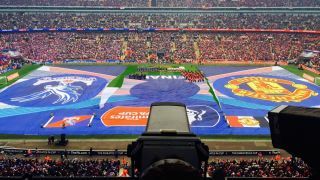 "A 'connected stadium' is one in which the infrastructure and the content strategy is built to provide a totally new way for the fan to engage and immerse themselves." By the time we get to the Tokyo 2020 Olympic stadium, fans should be able to watch replays and close-ups on a tablet. Qualcomm's LTE Broadcast tech could also make possible mobile TV in areas where bandwidth is congested, such as stadiums, although more likely is the launch of cutting-edge 5G mobile networks in Tokyo by Japanese telecom provider NTT DoCoMo.